How do I know if the books my child is reading are a good fit for him? This is a question I ask myself all the time. As Griffin is growing into a young reader, it is a challenge for me to find books that are just right for him to read independently. Over the past couple months, he has been able to read more and more words, but I have continued to struggle with finding books that aren’t too difficult or don’t appear too easy. That’s where the IRRC Family Resources Collection comes into help. If you search “find right books” in the Collection, you will find two resources (an article and a video) that can help you determine which books are just right for your child to read. These two resources share similar information, but each offers some unique tips for how to best select books with your child. 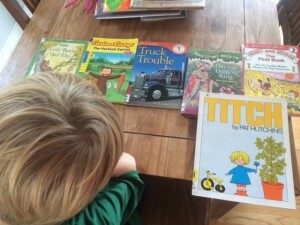 Keep reading to learn how Griffin and I used the “Finding the Right Books for Your Child” video and article to help Griffin find books that were a good fit for him. This article from the IRRC Family Resources Collection has great tips for how to select books that aren’t too difficult or too easy for your child. It, too, suggests the “five finger rule” as well as information on how to get your children motivated to read by searching based on their interests or for a particular author. Search “find right books” and click on the title with the green article icon below it to learn more. The video and article that share how to find the right books for your child helped me learn a strategy for how to select books that aren’t too difficult or easy for Griffin. I went to the library and quickly grabbed a stack of books that I thought would be of interest to Griffin. I grabbed chapter books, some “easy” readers, and some picture books. I told Griffin we were going to play the “five finger rule” game and he could start with any book he wanted. Naturally, he chose the truck book first. It was located in the “easy reader” section of the library, so I was interested to see how well he would do. Just as the video and article suggest, I allowed him to turn to any page he wanted to use. Since one page only has about three to five sentences, I had him read two pages to be sure. He read through those two pages and missed two words. One word was “to” which is a sight word he has known for a while and I think he overlooked, so I decided not to count it. The other was the word “nearby.” I do think this is a new word for his reading vocabulary, but this activity showed me that Truck Trouble was a book that is okay for him to read independently. Next, we tried two other books from the “easy reader” section of the library. He was able to read them without much support (he only missed one word on each page), so I think they are fine for him to read independently as well. Does his success with these books mean he can easily read all books in that section? No way. There are many books in that section that likely have more difficult vocabulary, so we will continue to test them out with the “five finger rule” when he will be reading independently. I asked Griffin to try to read a page from the chapter book I had checked out. He said he wanted to find the page with the least amount of words (see motivating male readers link), which didn’t surprise me. Since it was a chapter book, I thought for sure it would have too many challenging words and might frustrate him. Well, he actually read the first page and only had one word he wasn’t familiar with (appeared). He couldn’t believe he was able to read a page from a chapter book! I asked him to try another page, just to be sure. Griffin was able to read the second page and only had two words he didn’t know. Previously, we have read (together) other books in this series so that is probably helpful in his reading, but we were both delighted to see that this book could be a good fit for him to read independently too. Will I hand him the book and tell him to go read it in his room? No. He read almost each word correctly, but read pretty slowly. I want to make sure that he can read these pages AND understand them, so I will likely have him read a chapter to me and ask him questions to check his understanding. Nevertheless, he was thrilled to see that he could read chapter books. The “five finger rule” was very helpful in determining that Griffin can actually read and understand simple chapter books. Without this activity, I am not sure we when we would have had Griffin try to read a chapter book. The last book we tried was a Halloween themed picture book. There was a lot of text on each page, so I was interested to see how he would do with this book. I wondered if it would be easier, since it was a picture book. Ironically, he missed five words on the first page he tried. I had him try one more page and he missed six words! We talked about how this book was a better book for a read aloud than for independent reading. I had assumed that since it was a picture book it would be easier, but it most certainly was not. The chapter book we tried had way simpler language than this picture book. The five finger rule was an easy way for us to determine which books are good for Griffin to read independently and which are better saved for parent read alouds. If you are looking for tips on how to select the right books for your child, search “find right books” in the IRRC Family Resources Collection. The video and article you will find are both great sources of information and strategies on how to help your child select books that are challenging, but not overwhelming.